Employer retirement plans. Two employer benefits that encourage people to retire at relatively young ages have largely gone by the wayside in the private sector. First, the pervasiveness of employer health insurance for retired workers, by reducing their medical costs, used to make it easier for people to afford retirement before Medicare kicks in. And traditional pensions often gave workers a strong incentive to retire by their early to mid-60s, if they reached the target age and years of service required to maximize their pension credits. Pensions have largely been replaced by 401(k)-style retirement savings plans, which have the opposite effect. Studies show that people with 401(k)s retire about one and a half years later than similarly situated people with pensions. The reason: older workers don’t always have a clear idea about when they should retire, but they do know they can keep improving their future finances by saving more and reducing the length of time they’ll have to fund their retirement. Wives’ influence. 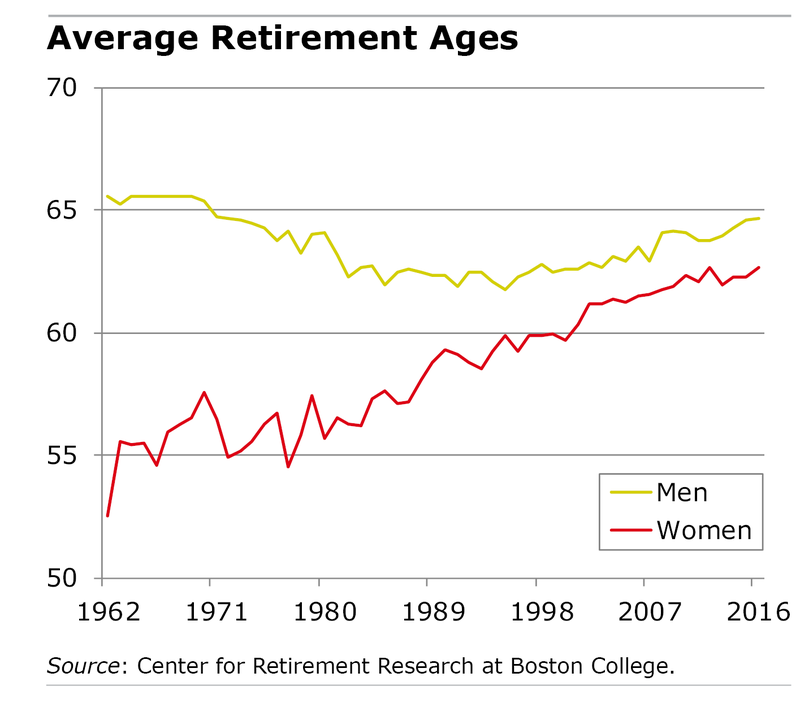 More women than ever are working, and couples often coordinate their retirement dates. Since husbands are three years older, on average, it is common for them to delay their own retirement until their wives retire. Health and longevity. In recent decades, Americans have generally been getting healthier and living longer, and older people may consider this and set a later retirement date. Our parents’ longevity is another influence on our expectations of long we’ll live. One study found that if someone’s parent dies unexpectedly, the worker is more likely to retire earlier than he’d planned. Economic changes. The shift away from manufacturing to a service-oriented economy means that more jobs aren’t as physically taxing, which makes it easier to work longer. The research clearly shows that the average retirement age for baby boomers has increased as they have continually adapted to the multitude of changes that have occurred over their lifetimes. The more difficult question for researchers to answer is when the forces that pushed up the retirement age will finally play themselves out. Concurrent with the trend in the chart is the decline in DB plans and increase in job mobility. Today, it is more common for people to retire more than once and to re-enter the workforce after retirement. Does this chart take this into account? Good article! To which I would add that employers have an improved attitude about having older workers around. May not be true everywhere. I am working, nearing 70 in age, and in a job that requires deep knowledge about our product and customers. My stated willingness to train other employees, make videos, write ref docs has made a big difference in how I am being treated versus say 10 years ago. Keep up the good work at the Center. The main reason that retirement age is rising is that many Americans are not financially able to retire. Many of these Americans will never retire. Many Americans, especially those that work for small businesses (less than 100 employees) do not even have access to a retirement savings plan. The sad irony is that the stress of a lack of sufficient savings and general daily financial worry are reducing life spans for individuals in this predicament. Unfortunately, our society primarily subsidizes the residential mortgages of individuals at the highest income levels while raising the age when an average worker is able to access SS benefits. In 1975, only 18% of the workforce ever qualified for DB-style pension benefits regardless of whether their employer offered such a plan, and the average benefit was a tiny 15% of final year’s wage. Today, 55% of workers have a DC-style 401k and the median balance of average 65-year old participants equates to annual payments at 24% of their last year’s wages. Moreover, today’s 401k participants can easily see and evaluate the value to their bottom line of working “X” years longer. By contrast, their parents were encouraged into retirement without regard for their ability to fund it simply because a random retirement date had been achieved with or without a pension. So, I suspect that today’s 401k participants are working longer because they can see a benefit in doing so, and not because DB pension participants feel any greater security in making that decision. I would be eager to see a study that confirms that. As you know, there are many people out there who are wildly distorting these facts. In order to counter them, it would be helpful to us if you would share some of your sources. Thank you. Talking about median balance of average 65 year old participants is a bit of unusual term matching, but I get the point. The takeaway is that if the median is so low, what does that say about the prospects for the lower half of those “participants” below the 24%. For many people at the median balance, Social Security would get someone to perhaps 50% of their last year’s wages. If someone is far below the median, where do you go?